Can Dimensionful Constants Have a Fundamental Meaning? As with many of the thoughts in this blog, this is contrary to common wisdom, but I think it particularly weird how the perceived wisdom that “only dimensionless constants can have fundamental meaning” has been established. 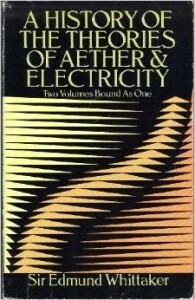 Not only has this idea become representative of a methodology that has replaced thinking by calculating, but the full ignorance of the statement reveals itself only if we look at the history of physics, for example, with the book “A History of the Theories of Aether and Electricity” by Sir E. Whittaker. First, let’s recall how the idea came to be. It doesn’t require exceptional intelligence to realize that our definitions of the meter and second, etc., are arbitrary, and it is just as evident that dimensionful constants, such as h, c, G, and others, are expressed with such arbitrary units. This discussion has attracted some attention in the debate over theories about the variable speed of light, and it has been claimed (e.g., by Ellis) that every dimensionful quantity can be set to unity using an appropriate reference. While this is a possible mathematical formulation, the question remains whether such a procedure makes sense physically. It doesn’t! If we think of a temperature map, then according to the above logic, as temperature is a dimensionful quantity, it could be set to unity at every point – the analogy is one-to-one, but the number of people appreciating a forecast with unit temperature would appear limited. This is probably why Einstein didn’t mind pondering the variation of a dimensionful quantity when he considered a variable speed of light in 1911. Are we to understand from Ellis’ critique that Einstein didn’t have a clue about the basics of his own theory? As one of the few reasonable people discussing the subject, John Duffield, has recently pointed out by reference to original quotes, that Einstein’s attempts around 1911 were a sound approach to describe the phenomenology of general relativity with a variable speed of light. In the meantime, other researchers have shown that even general relativity can be formulated in terms of a variable speed of light. Today’s physicists are not only ignorant about these ideas, but they are actively distributing the ideology that “only dimensionless constants can have fundamental meaning”, just like three theorists summarizing their discussion in the CERN cafeteria. Oh, had Einstein had the opportunity to listen to their half-assed thoughts, while having a cappuccino there! Surely, he would suddenly have understood how misguided his 1911 attempts on a variable speed of light were. (cf. Whittaker II, p. 153). There is more to tell, but to see the full absurdity of the “only dimensionless constants are fundamental” argument, look at Whittaker’s treatise on the development of electrodynamics. (vol. I, p. 232). Kirchhoff, Weber, and Maxwell would never have discovered the epochal relation ε0 μ0 =1/c2, and had they not assigned a meaning to the above “dimensionful” constants – our civilization would never have been bothered by electromagnetic waves. This entry was posted in Cosmology, Dirac, Einstein, Fundamental constants, History, Methodology, variable speed of light by AlexanderUnzicker. Bookmark the permalink. “This interpretation is perfectly valid and makes good physical sense, but a more modern interpretation is that the speed of light is constant in general relativity”. “Finally, we come to the conclusion that the speed of light is not only observed to be constant; in the light of well tested theories of physics, it does not even make any sense to say that it varies”. I spoke to editor Don Koks about this, but it isn’t an easy issue to fix. α calc = 136,2362014 ( 0,58% of error). I think your ideas are very good and the basic questions that I used to develop my model are very close to what you indicated to be important in the book (nature of time based on positrons behavior, where did the antimatter? Why the gravitational force is so weak?). Reading your book I finally understand why this happens! Recently, I’ve been trying to explain impedance matching (in the classical realm of electronics) to a biologist and it’s not easy. I’ve always thought of impedance as simply an opposition to flow (current) under pressure (voltage), but really, it is the governing factor in transferring power (pressure x flow).